Deepwater Horizon is based on the events of the catastrophic blowout that occurred on the drilling rig in the Gulf of Mexico in April 2010. The resulting explosions and fire killed 11 men, injured many others and caused major environmental damage. The film version, directed by Peter Berg, is a powerful and absorbing portrayal of the crew in the hours leading up to the accident, crediting a New York Times article as its source material. In disaster movies based on real life events, you know from the start that this is not going to end entirely well. But the dramatic potential is maximised by the underlying tensions in the story, the quality of the acting and realistic special effects. Mark Wahlberg, in the lead, plays Mike Williams, an engineer on the rig, and creates a strong, heroic character. The predictable family scene at the start (with wife, Kate Hudson) is enhanced by a memorable ‘show and tell’ by his daughter who rather chillingly illustrates the ever-present dangers beneath the ocean. Offshore drilling is highly technical and by necessity, the account has been truncated and simplified. Nevertheless, the film production manages to convey through punchy dialogue, shots of control panels and subsea structures, what the crew are doing as they run the final tests to ensure that the well is safe. Of course, it isn’t safe – the high pressure hydrocarbons are not going to be controlled and the story tells us why this happened with vivid footage illustrating the horrors of a blowout for the crew trapped on the exploding rig. 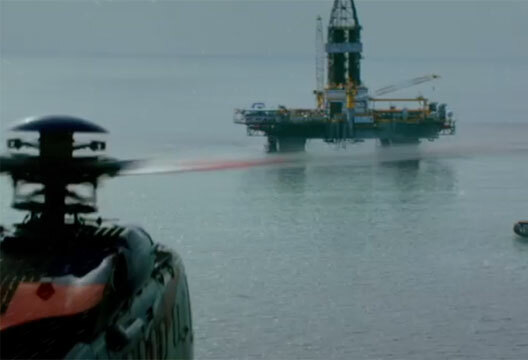 The most interesting psychological dimension of the film and a key focus of the subsequent accident enquiries, is the interaction between the BP ‘company men’ on the rig and the Transocean drill crew. In his classic ‘bad guy’ role, John Malkovitch plays BP well site leader Donald Vidrine, who wants to push on and get the well completed. In counterpoint, Kurt Russell, convincingly, takes the role of Jimmy Harrell, the Transocean manager in charge of the rig who is concerned that appropriate safety measures are not being maintained. There can be tensions in any workplace between operator companies and their contractors. But this is brought into sharp relief as Vidrine starts to exert pressure and tries to outsmart the drillers by his technical explanation for the anomalous test results. (In fact, the film has some small but not insignificant differences at this point from the investigation reports, where it is reckoned that it was one of the Transocean crew who introduced the new explanation. As key members of the drill crew were killed, aspects of this element of the accident remain uncertain). Decision making for an offshore well does not only take place on the rig and little attention is given the role of the onshore managers, particularly those in BP, who made decisions that influenced well safety. But the screenplay sensibly does not attempt to make this into a documentary. The film is a vivid demonstration of how pressures for profit can imbalance fragile safety mechanisms. Exploration for oil and gas is a risky business and the final tribute to the 11 men who died is a salutary reminder of the true costs of getting that balance wrong. - Rhona Flin, Professor of Industrial Psychology, Aberdeen Business School, Robert Gordon University. Read her analysis of the incident in our archive.